Created by Boston Children’s Museum, published by Cheng & Tsui, 2009. Hangzhou is a fortunate choice for setting since it is a modern city adjacent to beautiful rice-growing countryside. Each vignette thus explores traditional Chinese culture against the backdrop of contemporary life. Doudou (a nickname) visits her grandparents on their farm outside Hangzhou, where she helps her grandfather plant rice and her grandmother create crafts. Weicheng is shown in his modern apartment helping prepare “long-life” noodles and tea shrimp for his grandmother's birthday celebration. 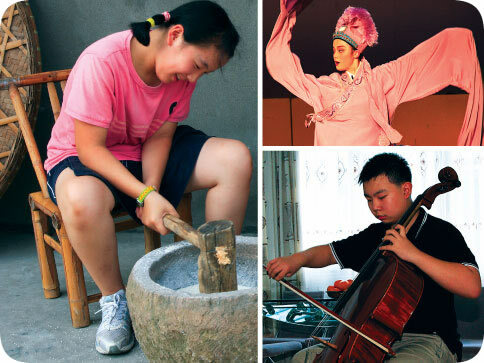 Qianyun is a student at the Zhejiang Professional Art School, where she is studying traditional Chinese opera. Her parents are both professional Chinese opera performers. Gangzheng invites the viewer to his ninth grade class, where they are studying the abacus, and to a basketball game after school. Although the teens’ lively personalities offset this somewhat, the film does focus on exotic and traditional activities, reinforcing some stereotypes about China. For example, although Gangzheng's math teacher is shown teaching the abacus, most math classes in China today look very much like their American counterparts, with students using calculators. Students do study the history of Chinese opera in high school, but it is likely that most spend more time listening to rock and roll. The accompanying glossary, facilitator’s guide and pronunciation guide are quite useful and should be reviewed before viewing the video. For example, the two sets of grandparents in the videos have different kinship terms of reference and address based upon whether they are related through the father or mother, an important distinction in Chinese culture. The printable activities for students look tasty and/or simple to make and can be adjusted for students of different ages. Unfortunately, the Bonus Material section in which Qianyun shows the stylized movements of Chinese opera is misleadingly labeled "Chinese Dance Demonstration." Although the videos do not correct all the stereotypes about China, the children from Hangzhou are natural, open, and inviting. In their daily activities, the old and new coexist easily, allowing the viewer to see how the children's lives reflect a culture modern yet uniquely Chinese. Children of Hangzhou is Available from Cheng and Tsui. "Ind" and "Lab" refer to "Individual" and "Language Lab" versions of Cheng and Tsui's software and audio items. Cheng & Tsui offers both Language Lab (Lab) and Individual (Ind) versions of their software and audio learning materials. Lab versions are specifically for use in a language laboratory or classroom setting, and include a site license. Teachers may offer the lab version to multiple students in a language lab, or in the classroom. Individual versions of software and audio learning materials are for individual use only and duplication is prohibited. There is no difference in the material for Individual and Language Lab versions. The fee for the site license covers development costs of materials and software, which means that those costs are kept separate from the costs of the printed textbooks. This enables us to keep textbooks as affordable as possible for all of our institutional customers, whether or not they use a site license. Site licenses never expire, and upgrades are available at a significant discount.